Often buying a smartphone, we all have a confuse what smartphone buy. On the day the smartphone companies offer their smartphones in the market. Every company offers attractive features and specifications to entice its customers, thereby raising the dilemma of the customers slightly. Realime has a 6.2-inch HD Plus display that is introduced with the Nokia feature. Its resolution is 720x1520 and the aspect ratio is 19: 9. At the same time, the Radmi Note 5 display is 5.99 in full HD whose resolution is 10180x2160 and the aspect ratio is 18: 9. The new Honor smartphone has a 5.84 inch Fullchidi Plus display with resolution of 1080 × 2280 pixels. The aspect ratio of the screen is 19: 9. Reality 2's base variant has been launched in the market with 3 GB RAM and 32 GB internal storage. The base variant of the Redmi Note 5 is available with 3GB RAM and 32GB of storage, while the Honor 9N also has the same base variant as both. In addition, the three smartphones have been launched in the market with different variants. Reality is available with 2 dual rear camera set-up. The primary sensor is 13 megapixels and secondary sensor is 2 megapixels. Talk about the front camera of Reality 2, its selfie camera is 8 megapixels, which is presented with artificial intelligence. In Redmi Note 5, there is a 12-megapixel rear camera for photography and there is a 5-megapixel front camera for selfie. At the same time, Honor 9N has a dual rear camera setup with LED flash, whose sensor is 13 and 2 megapixels and the rear camera comes with Bokeh effects. There is a 16 megapixel sensor on the front for selfie and video calls. Realy 2 smartphone comes with the Adreno 506 GPU with the 1.8 GHz octa-core Qualcomm Snapdragon 450 processor. Shaomi Redmi Note 5 has been given with Qualcomm Snapdragon 625 processor. At the same time, the Honor 9N handset has the Octa-Core Haciilikon Kirin 659 chipset and has been given the Mali T830-MP3 GPU for graphics. Reality 2 handset works on ColorOS 5.1 based on Android OreO 8.1. The Redmi Note 5 runs on the Android Orio 8.1 operating system, and if there is talk of Honor 9N, then the smartphone runs on Android 8.0 based EMUI 8.0. Reality 2 Powerful Battery has been given with 4,230 mAh. Whereas 4,000 MAH batteries have been given in Redmi Note 5. At the same time, 3,000 mAh batteries have been given to power the device in Honor 9N. Most importantly, what is the cost of smartphones, the price variant of Reality 2 is worth 8,990 rupees. The base variant of Radmi Note 5 is priced at Rs 9,999 and at the same time, the base variant of Honor 9N 3 GB Random and 32GB storage is priced at Rs 11,999. For your information, please tell that the price of different variants of the three handsets is different according to their RAM and storage. 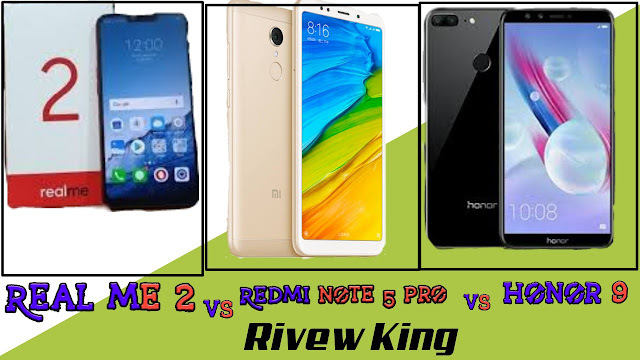 So it was a comparison of mid-rand smartphone, hopefully after reading the article, it would have been easier for you to choose a smartphone.